The XBTS’s user-friendly interface makes this BitShares platform easy to use for anyone. XBTS supports decentralized trading on all popular altcoin pairs without a single point of failure. You always hold the private keys to your funds, only you have access to them. Profitable investment opportunities and conditions. The list of coins will be updated. A place for everyone who wants to simply and secure buy and sell Bitcoins or Altcoins. Instant buy/sell of cryptocurrency at fair price is blockchain guaranteed. Nothing extra. Maximum processing speed of your transactions.100.000 transactions per second.Confirmation time of just 3 seconds. Built using the latest in industry research, BitShares 2.0 offers a stack of financial services including exchange and banking on a blockchain. XBTS no limits: the BITSHARES 2.0 protocol is unable to limit your trading experience. You can trade any amount, at any time, from anywhere, without withdrawal limits. With XBTS, no one must approve your account. Network growth through adoption rewards. You have complete financial freedom. XBTS DEX IS YOUR PERSONAL GATEWAY TO INVEST AND TRADE! For the sake of convenience SMARTCOINS, such as bitUSD, bitEUR, bitCNY, and others, are denotes simply as USD, EUR, CNY, etc. in the wallet. These digital tokens represent the same value as their underlaying physical asset. Hence 1 USD in this wallet is worth $1 and can be redeemed as such. XBTS runs on of the BitShares Blockchain which is decentralized by DPoS consensus. Decentralization gives XBTS robustness against failure. Users are in control of their own security, which can be much better than any centralized entity. MOST EFFICIENT, MOST DECENTRALIZED, AND MOST FLEXIBLE CONSENSUS MODEL AVAILABLE. DPOS leverages the power of stakeholder approval voting to resolve consensus issues in a fair and democratic way. XBTS DEX IS DECENTRALIZED ACROSS THE GLOBE. NO SINGLE POINT OF FAILURE. XBTS has several different kinds of accounts: Basic Account, Annual Member, and Lifetime Member. Basic Accounts are Free, but do not qualify for the referral program, not any cash back on transaction fees. I looked into your website and tried contacting you, is the Telegram handle correct? bitshares-ui use lib fraction.js 2 year latest update. Best open an issue in github to discuss that, thanks! Blockchain Bridge between Waves Dex and BitShares on XBTS DEX Exchange! The new decentralized technology of XBTS blockchain exchange opens the doors for Waves tokens which want to expand the geography in BitShares network. BitShares platform more available for all users. Now, Waves tokens can be easily sent to BitShares platform and back 1:1 through XBTS.io gateway at any time. XBTS operates on BitShares blockchain and provides the access to convenient and fast instruments for storage, trade, management and issue of digital assets. XBTS Dex is a convenient and secure blockchain service which unites Waves Dex and BitShares. An example of compatibility of the two popular platforms is CoffeeCoin, a token created on Waves platform. CoffeeCoin was the first one to use powerful instruments of BitShares blockchain available for everyone at XBTS exchange. Fill the form and WIN FREE LISTING AT 2 POPULAR DEX EXCHANGES – XBTS AND BITSHARES. Adding cryptocurrency to a decentralized exchange is very easy! to get on 2 decentralized exchanges: XBTS and BitShares. Voting is carried out in SmartHoldem coins (STH). ALL funds participating in the voting for the winner of the round shall RETURN to the wallet of the voter with a network fee of 0.5 STH. You can vote for a coin participating in the voting with any number of SmartHoldem coins, the minimum number is 1 STH. In each round, three projects with maximum balances are determined as winners! The minimum amount for a coin to get into the winning top-3 is 75 000 STH. If within 3 months the coin did not reach the winning TOP 3 of the round, the funds shall be returned to the wallets of the participants who voted for it. TIn each round, TOP 3 projects with maximum balances are determined as winners on the 1st day of each month 00:00:00 UTC+1 If your cryptocurrency holds one of the 3 positions on the leaderboard during the round, this means that your cryptocurrency will be added to the XBTS exchange. If any of the candidates credits the amount of STH, which is greater than yours is, this participant shall move to a higher position in the voting list, to the extent of exclusion of your cryptocurrency from the top-3 list. However, your cryptocurrency may still have a chance to win the next round in the next month. The voting winners will be announced in the official XBTS public group on Telegram, Twitter, BitcoinTalk. You can vote from the SmartHoldem Wallet or your XBTS or BitShares account. Please note! Only forks of the following cryptocurrencies can take part in the voting: Bitcoin, Litecoin, Dash, Waves, NovaCoin, Peercoin. If for some reason the code base of your cryptocurrency does not match any of the code bases specified in the call for votes, fill in the standard listing form https://xbts.io/add-coin.html! 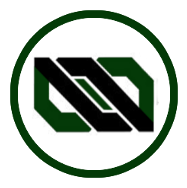 Upon submitting the form, the coin starts participating in the voting. You can send your STH votes to the dedicated address. We believe that your coin will become the TOP3 winner in the list of candidates win a free listing on 2 DEX exchanges. XBTS team created a blockchain protocol that allows a communication between Ethereum and BitShares. 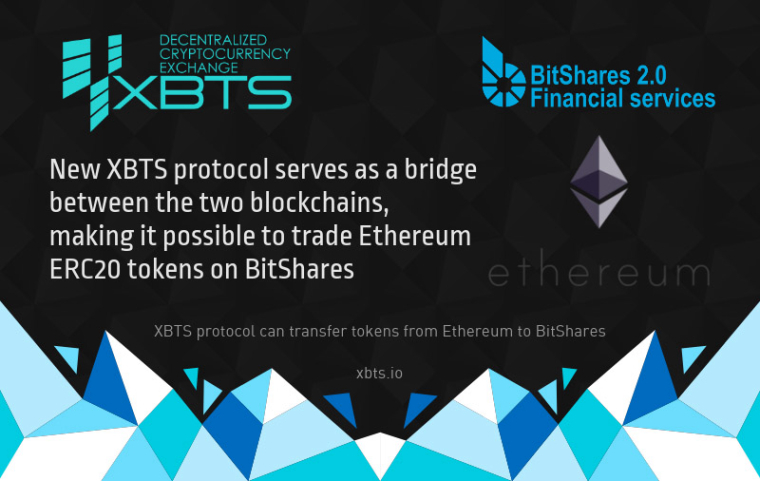 New XBTS protocol serves as a bridge between the two blockchains, making it possible to trade Ethereum ERC20 tokens on BitShares. XBTS built the code to achieve a real token transmission and not simple cloning of tokens. This avoids an artificial number of tokens on two chains and guarantees a swap between blockchains with the lowest fees. Now you can send ERC20 tokens to BitShares and back at any time. XBTS Exchange expands the geography for Ethereum tokens. You can create any pair in any direction. You can add your ERC20 token to XBTS DEX by filling out the standart listing form at https://xbts.io/. XBTS Exchange is confident that the development of this technology can contribute to the growth of both blockchains by serving as an essential tool to guarantee their interoperability. An example of compatibility of the two popular platforms is BBI Token a token created on Ethereum platform, Beluga Pay - One of Latin America`s 15 most promising startups according to TechCrunch. BBI ERC20 Token was the first one to use powerful instruments of BitShares blockchain available for everyone at XBTS exchange. XBTS built the code to achieve a real token transmission and not simple cloning of tokens. Interesting. Can we see the code? Do you have a whitepaper or similar high-level technical (!) explanation? We're excited to introduce XBTS Exchange new look! 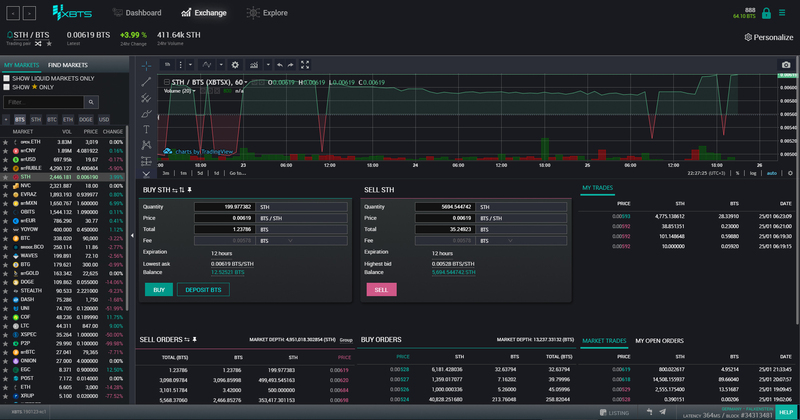 XBTS decentralized exchange has undergone a major redesign and UI update, making it more user-friendly and professional-looking than ever before! Most recent set of updates brings the XBTS DEX into line with the user experiences of the most popular crypto exchanges, and in fact offers even more interested functionality. We expect to see many, many more traders take the step to using a BitShares decentralised platform. New opportunities for traders and holders! Payments on the deposit are made every two weeks in coins/tokens traded at the exchange. Due to its unique value propositions, Smartholdem stands out against other revenue-sharing exchange assets. SmartHoldem Coin (STH) is the core XBTS DEX asset. It is used in voting https://vote.xbts.io/ and Smartholder depositing at XBTS. Staking at XBTS is freezing coins (voluntary blocking of STH balance) for a selected period of time: 1 month, 3 months, 6 months or 12 months. 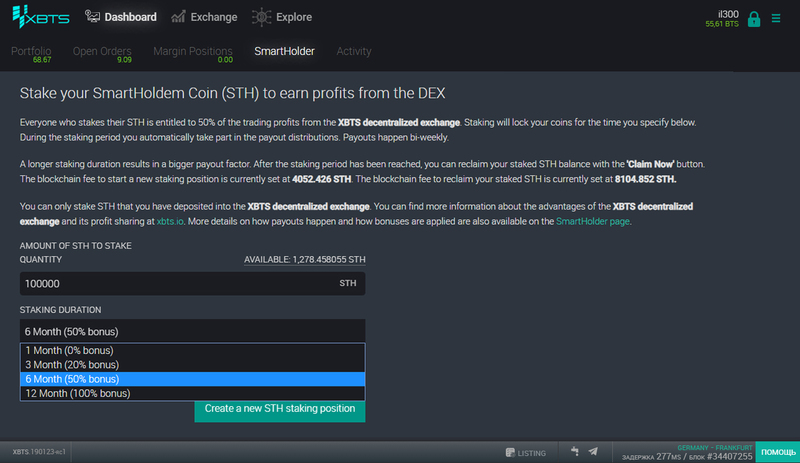 Use your SmartHoldem Coin (STH) to profit from XBTS DEX. Everyone who deposits their STH is entitled to get up to 50% of XBTS DECENTRALIZED EXCHANGE trading profit. “Trading profit” refers to trade transactions: withdrawal, submitting orders, fees charged for purchase and sale of an asset from an exchange. By staking you confirm the freezing of coins in the BitShares blockchain for a selected period. A Stake is a vesting transaction that cannot be unfrozen until the end of the period. After the stake period ends, you can return your STH balance by pressing 'Claim Now' button. During the stake period, you automatically take part in distribution of trading profit. Payments are made every two weeks. They are credited to your exchange account and become available for use immediately. The amount of payments depends on the amount of fees, the number of trade transactions at XBTS and can reach up to 50% of the total volume for a certain period. Also, the total number of frozen coins affects the size of payments, since the accrual rate is calculated based on two parameters: the total number of coins and the freezing period. After the deposit period ends, interest is not accrued. The participant should unfreeze their assets by performing a withdrawal transaction. When choosing the stake period, XBTS adds a bonus of up to 100% to each stake. The percentage of profit from XBTS trading fees is distributed depending on the weight of your Stake. For example, when choosing depositing for 6 months, the weight of your Stake increases by 50%, for 12 months — by 100%. The bonus increase is used only for calculating the percentage of trading profit when distributing Smartholder payments!!! The longer the period (duration) of the Stake, the greater the payout rate. More information about how payments are made and how bonuses are calculated is available on the Smartholder web-site. This information is for informational purposes only and should not be understood as investment advice.